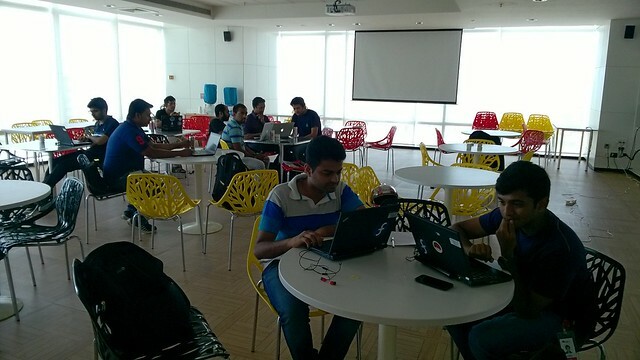 We organized Docker Global Hack Day at Red Hat Office on 19th Sep’15. Though there were lots RSVPs, the turn up for the event was less than expected. We started the day by showing the recording of kick-off event. Alan and Fayiz worked on PaaS idea, which can be used for setting up dev and qa environment. dockercomp – Archit Sharma (@arcolife) – Local Hackathon Winner. Archit was winner of Docker Global Hack Day #2 as well for the same project. He updated the same project in this hackathon. His project is about crowd source analysis by using distributed computing through Docker. Himanshu was exploring the idea of visualizing multi-host Docker networking. By looking at runC demo in the kick-off video, we thought it would be good if we can run containers on GlusterFS and use it move containers around by saving and restoring the containers on shared volume. I did not work on specific idea but I was helping teams and other attendees with their questions. I also worked on my upcoming tutorial at Linux Con, Europe on Data and Networking management with containers. May be because of long weekend and other events we got less participation. Hopefully we do better next time.